Waltzing Matilda: Jesse Tree Swap #3! Hi… My name is Charlotte… and I'm a Jesse Tree Swap addict. I settled on a white, painted body with an embroidery thread belt and a blue felt veil that was pinned down to the sides with a little dab of glue lest a good, strong breeze carry Our Lady away. Just like last year's St. Elizabeth, there is an embroidery thread hanger attached to the top of the veil. I was going to do a wordy tutorial showing you step by step how to make this and apologizing for my unattractive fingernails but I didn't know if anyone would really be interested (unless maybe you are doing a Jesse Tree Swap too) so I just put this little collage together instead and I'll let the pictures do the talking. How sweet! This is my first time participating in a swap and I already know I'd do it again in a heartbeat... and we haven't even received the ornaments yet! Thanks for the little tutorial! Your creations are absolutely darling, as always! Very cute! I actually did the Mary ornaments for Karen's swap #2. I am pretty happy with them, but they are certainly not as creative as yours! I'm sure yours are lovely! Every has a different style and different tastes. That's what makes easy swap unique and part of the reason I can't stop agreeing to them! Ooooo how cute. I signed up with Karen's swap #1 too! We have Ruth and her wheat. I just bought the supplies this weekend...thanks for the inspiration to finish THIS week! Oh Charlotte, she is lovely. I had to pull out, a blood clot has developed in my arm giving me intense pain. I felt terrible, I had to pull out of making costumes for a play as well - something I love. God has a way of slowing us down sometimes. I hope Karen will let me try again next year - I can easily see why you are an addict, I would love to receive those boxes as well! I am in the swap too. #1 and #2- so does that make me an addict also? haha!! I put my pics up too. You did a great job on Mary! We also participated in swap #1 (we made #3 - the serpent and apple) and were so excited to receive our box yesterday! My almost 2-year-old daughter has claimed your Mary ornament as her own... I have a feeling I'll be needing to follow your tutorial to make a spare (or two!) so we'll have one to keep with the Jesse Tree set and one for her to "love." I also think I'll be needing to find somewhere high and out of reach to put our tree so she doesn't take both Mary's. 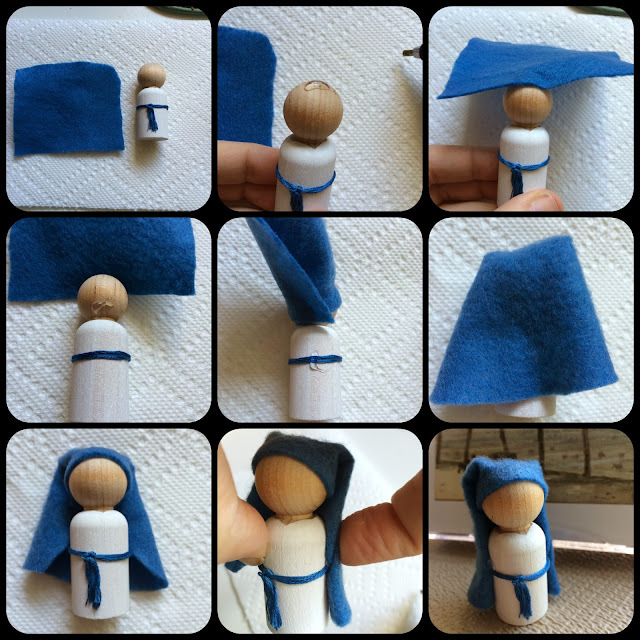 :-) Thanks so much for making such a beautiful ornament and for sharing the tutorial! Have a blessed Thanksgiving.